BMAM SOUTHERN JAM CANCELLED FOR FEB 12! 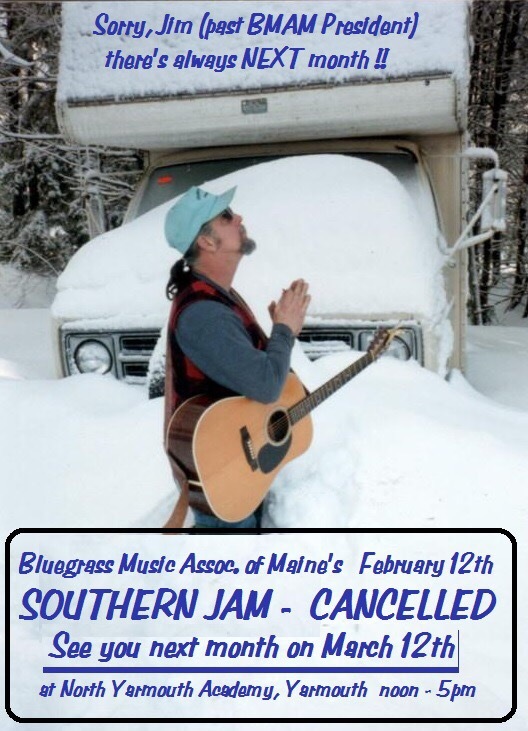 ATTENTION: CANCELLATION – BMAM SOUTHERN JAM scheduled for February 12th at the North Yarmouth Academy Music Room in Yarmouth, Maine is cancelled. PLEASE pass the word to all your fellow pickers (who may not be online). Please stay safe and off the roads in this upcoming snow storm! Looking forward to seeing everyone at the next Southern Jam on March 12th noon to 5pm.